British view of a "Group of Kanem-Bu warriors," c. 1880s. The Kanem–Bornu Empire was an African trading empire ruled by the Saf dynasty from the ninth to the nineteenth centuries. It encompassed, at varying times, the areas belonging to the modern nations of southern Chad, northern Cameroon, northeastern Nigeria, eastern Niger, and southern Libya. The Lake Chad area, around which the kingdom was centralized, was by virtue of its central location, a natural connecting point in the vast network of Saharan and Sudanic trade routes. The prosperity gained through the control of these trade routes provided the basis for the growth and strength of this thousand–year empire. The Kanem Empire is estimated to have originated around 800 C.E. to the northeast of Lake Chad. It was located at the southern end of the trans-Saharan trade route between Tripoli and the region of Lake Chad, the control over which played a significant role in Kanem's development. A vital crossroads between the north-south trade routes and east-west trade routes to Nubia, a political state naturally formed. The empire included a confederation of nomadic peoples who spoke languages of the Teda–Daza (Toubou) group. One theory, based on early Arabic sources, suggests that the dominance of the Zaghawa people bound the confederation together. In approximately 850 C.E., the Sayfawa, took the throne drawing on an ancestral link to Sef, which was identified with the legendary Yemenite hero Sayf ibn Dhi Yazan. Due to the link to Sef it became customary to call the second ruling dynasty Sayfawa instead of Sefuwa. Both, the Duguwa and the subsequent Sayfawa, seem to have belonged to the same ruling establishment of the Magumi. Also the royal title Mai would appear to have been shared by the Duguwa and the Sayfawa, denoting the perception of the rulers as divine. The major factor that influenced the history of the state of Kanem was the early penetration of Islam. North African traders, Berbers and Arabs, brought the new religion. Towards 1086 C.E. Kanem began a process of Islamization that can be traced to Hume, a Sefawa king who converted to Islam and declared it the official state religion. He began a dynastic tradition of Muslim Sefawa kings that would continue for 800 years. Islam offered the Sayfawa rulers the advantage of new ideas from Arabia and the Mediterranean world, as well as literacy in administration. But many people resisted the new religion favoring traditional beliefs and practices. Once the Sayfawa lost political power, the royal establishment abandoned its capital of Manan and settled in the new capital Njimi further south of Kanem. By the thirteenth century, Kanem's rule expanded, and was coupled with marked population growth in Njimi. 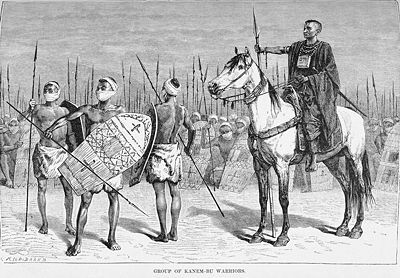 Even though the Kanembu became the main power-base of the Sayfuwa, Kanem's rulers continued to travel frequently throughout the kingdom and especially towards Bornu, west of Lake Chad. Herders and farmers alike recognized the government's power and acknowledged their allegiance by paying tribute. Kanem's expansion peaked during the long and energetic reign of Mai Dunama Dabbalemi (ca. 1221–1259), also of the Sayfawa dynasty. Dabbalemi initiated diplomatic exchanges with sultans in North Africa and apparently arranged for the establishment of a special hostel in Cairo to facilitate pilgrimages to Mecca. During his reign, he declared jihad against the surrounding tribes and initiated an extended period of conquest. His wars of expansion reached as far north as the Fezzan, allowing Kanem control of the northern trade routes. The empire's influence also extended westward to Kano (in present-day Nigeria), eastward to Ouaddaï, and southward to the Adamawa grasslands (in present-day Cameroon). Portraying these boundaries on modern maps can be misleading, however, because the degree of control extended over the tributaries weakened corresponding to the amount of distance between the tributary and the capital, Njimi. Dabbalemi devised a system to reward military commanders with authority over the people they conquered. This system, however, tempted military officers to pass their positions to their sons, thus transforming the office from one based on achievement and loyalty to the mai into one based on hereditary nobility. Dabbalemi made attempts to suppress this tendency, but after his death, dissension among his sons weakened the political authority of the Sayfawa Dynasty. Dynastic feuds degenerated into civil war, and Kanem's outlying peoples soon ceased paying tribute. By the end of the fourteenth century, internal struggles and external attacks had torn Kanem apart. Between 1376 and 1400, six mais reigned, but Bulala invaders (from the area around Lake Fitri to the east) killed five of them. This proliferation of mais resulted in numerous claimants to the throne and led to a series of internecine wars. Finally, around 1396 the Bulala forced Mai Umar Idrismi to abandon Njimi and move the Kanembu people to Bornu on the western edge of Lake Chad. With the new center of the empire at Bornu, it became known as the Bornu Empire. Over time, the intermarriage of the Kanembu and Bornu peoples created a new people and language, the Kanuri. With control over both capitals, the Sayfawa dynasty became more powerful than ever. The two states were merged, but political authority still rested in Bornu. Kanem-Bornu peaked during the reign of the outstanding statesman Mai Idris Aluma (c. 1571–1603). The Bornu empire entered into a second period of expansion in the late fifteenth century under the rule of Mai Ali Gaji (1472-1504). Under his leadership the Bornu empire significantly expanded westward, culminating in conquest over the Hausa state of Kano. He also expanded northward and cemented Bornu control of the northern trade routes to the Fezzan. His legacy of expansion was continued by Katarkamabi, who ruled Bornu from 1504 to 1526. But even in Bornu, the Sayfawa Dynasty's troubles persisted. During the first three-quarters of the fifteenth century, for example, fifteen mais occupied the throne. So successful was the Sayfawa rejuvenation that by the early sixteenth century Mai Ali Gaji (1497–1515) was able to defeat the Bulala and retake Njimi, the former capital. The empire's leaders, however, remained at Ngazargamu because its lands were more productive agriculturally and better suited to the raising of cattle. With control over both capitals, the Sayfawa dynasty consolidated political power and authority over vital trade routes. The two states were merged, but political authority still rested in Bornu. Kanem-Bornu peaked during the reign of the outstanding statesman Mai Idris Aluma (c. 1571–1603). Aluma is remembered for his military skills, administrative reforms, and the example he provided of Islamic piety. His main adversaries were the Hausa to the west, the Tuareg and Toubou to the north, and the Bulala to the east. One epic poem extols Aluma's victories in 330 wars and more than 1,000 battles. His military innovations included the use of walled fortifications and military camps, permanent seige warfare, scorched earth tactics, and the effective use of calvary. Aluma is also noted for his inclusion of Berber camelry and Kotoko boatman as part of his military forces. He fostered diplomatic relations with Tripoli, Egypt, and the Ottoman Empire, which sent a 200-member ambassadorial party across the desert to Aluma's court at Ngazargamu. Aluma also signed what was probably the first written treaty or cease-fire in Chadian history. Aluma introduced a number of legal and administrative reforms based on his religious beliefs and Islamic law (shari'a). His desire to make sure that his court properly reflected the virtues of Islam led him to mandate that major political figures lived at the court, and he reinforced political alliances through appropriate marriages (Aluma himself was the son of a Kanuri father and a Bulala mother). As with other dynamic politicians, Aluma's reformist goals led him to seek loyal and competent advisers and allies, and he frequently relied on slaves who had been educated in noble homes. Aluma regularly sought advice from a council composed of heads of the most important clans. Kanem-Bornu under Aluma was strong and wealthy, due to the revenue demanded from conquered territories, the sale of slaves, and control of the trade routes linking the Lake Chad area to the Saharan trade. Between Lake Chad and Fezzan lay a sequence of well-spaced wells and oases, and from Fezzan there were easy connections to North Africa and the Mediterranean Sea. Many products were sent north, including natron (sodium carbonate), cotton, kola nuts, ivory, ostrich feathers, perfume, wax, and hides, but the most important of all were slaves. Imports included salt, horses, silks, glass, muskets, and copper. The administrative reforms and military brilliance of Aluma sustained the empire until the mid-1600s, when its power began to fade. By the late 1700s, Bornu rule extended only westward, into the land of the Hausa of modern Nigeria. In the late 1700s, Fulani people were able to make major inroads into Bornu by invading from the west. By the early nineteenth century, Kanem-Bornu was clearly an empire in decline, and in 1808 Fulani warriors conquered Ngazargamu, marking the decline of the Kanem-Bornu legacy. Usman dan Fodio led the Fulani campaign and proclaimed a holy war on the irreligious Muslims of the area. His campaign eventually affected Kanem-Bornu and inspired a trend toward Islamic orthodoxy, but Muhammad al-Kanem, a warlord of Kanem, contested the Fulani advance. Muhammad al-Kanem was a Muslim scholar and non-Sayfawa warlord who had put together an alliance of Shuwa Arabs, Kanembu, and other seminomadic peoples. As a base for the resistance he eventually built a capital at Kukawa in 1814 (located in present-day Nigeria). Sayfawa mais remained titular monarchs until 1846. In that year, the last mai, in league with Ouaddai tribesmen, precipitated a civil war. It was at that point that Kanem's son, Umar, became king, thus ending one of the longest dynastic reigns in regional history. Although the dynasty ended, the kingdom of Kanem-Bornu survived. Umar, who eschewed the title mai for the simpler designation shehu (from the Arabic shaykh), could not match his father's vitality and political prowess, allowing the kingdom to be ruled by advisers. His reliance on advisors led to increasing political disorganization, a major contributor to the final dissolution of the empire. When coupled with regional particularism, and attacks by the militant Ouaddai Empire to the east, the empire was set on the road to destruction. The decline continued under Umar's sons. In 1893, Rabih az-Zubayr leading an invading army from eastern Sudan, conquered Bornu. Lange, Dierk. 2004. Ancient kingdoms of West Africa: African-centred and Canaanite-Israelite perspectives; a collection of published and unpublished studies in English and French. Dettelbach, Germany: Röll. Urvoy, Yves. 1949. L'empire d u Bornou. Paris. Lange, Dierk. The Chad region as a crossroads Africa and the Ancient World. Lange, Dierk. The kingdoms and peoples of Chad Africa and the Ancient World. B. Schemmel. Traditional polities Rulers.org. This page was last modified on 11 April 2018, at 14:18.